To get some idea of how far ahead China's leaders planned, consider that the People's Bank of China (PBOC) made its first move way back in 1994 – more than 20 years ago. That's when the PBOC first pegged the yuan currency to the U.S. dollar. And it was part of a series of market reforms intended to enhance the growth of the Chinese economy and put it on a path to challenge the United States. In 2005, China modified the yuan currency peg to include a basket of world currencies. That allowed the yuan to appreciate 25.8% by 2009 – a key step toward preparing the yuan for reserve currency status. The financial crisis of 2008-2009 presented China with an opportunity to suggest a major change to the global financial system – a change that would include a yuan reserve currency. In particular, PBOC Governor Zhou Xiaochuan proposed in March 2009 that the "Special Drawing Rights" (SDR) of the International Monetary Fund (IMF) be expanded into a "super-reserve currency" that would replace the U.S. dollar. In his proposal, Zhou strongly hinted that the yuan be included in the SDR's basket of currencies, currently made up of the dollar, the pound, the yen, and the euro. Shortly afterward, China quietly started making deals with countries like Brazil, Russia, and Vietnam to settle bilateral trade deals in yuan instead of dollars. These moves and several others succeeded in raising the yuan's standing in world trade. According to the Society for Worldwide Interbank Financial Telecom (SWIFT), the yuan rose from 35th as a global payment currency in 2010 to fifth as of June of this year. A Yuan Reserve Currency Makes the Dollar a "Product of the Past"
By 2011, Chinese President Hu Jintao was publicly dismissing the reserve currency status of the U.S. dollar as a "product of the past." He jumped the gun, but the quote is revealing. And every day, China's master plan grows closer to fruition. Just a few weeks ago, China's central bank, the PBOC, made adjustments that effectively devalued the yuan currency. Most Wall Street analysts assumed the main reason for the devaluation was to bolster the Chinese economy. But they're wrong, said Money Morning Chief Investment Strategist Keith Fitz-Gerald. "What they don't understand is that China's been propping up the yuan for years to stabilize the yuan's role in international trade as a potential reserve currency for the International Monetary Fund," Fitz-Gerald said. What the PBOC did was to increase the yuan's exposure to market forces. "That's exactly what's required by the IMF for reserve status – that a currency be freely usable and market-driven," Fitz-Gerald said. For China, all the years of planning and preparation are about to pay off. China was close to achieving its goal as early as October of this year, when the IMF was scheduled to vote on the yuan reserve currency status in the SDR basket. A few weeks ago, the IMF decided the yuan wasn't quite ready. But it has a schedule in place that all but ensures a yuan reserve currency as of September 2016. When the yuan reserve currency becomes a reality, it carries grave implications for the dollar and the U.S. economy. 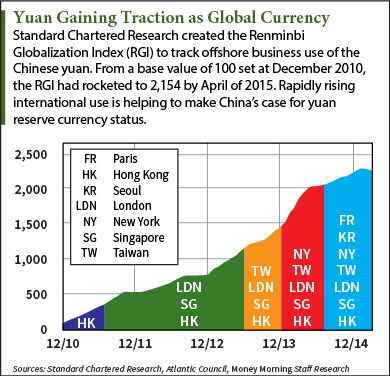 Approximately 10% of global reserves – $1 trillion – will switch into the yuan practically overnight. When foreign governments start to dump the $6 trillion they hold, U.S. dollars will flood the market and trigger massive inflation. But as bad as that sounds, the rise of the SDRs is the primary threat. The CIA's Asymmetric Threat Advisor, Jim Rickards, says SDRs are just a softer term for "world money." "That's why they came up with the name Special Drawing Rights – because if they called it 'world money' that would sound a little spooky and scary," he said. The IMF's plan to dethrone the U.S. dollar – with China's help – is in fact part of a grand scheme to put the IMF in charge of the world's monetary system. In short, the IMF wants to be "the central bank of the world." Yet as ominous as that sounds, it's only one of several flashpoints Rickards sees that threaten the U.S. dollar. In fact, Rickards has uncovered evidence of a looming economic crisis that will eclipse even the Great Depression of the 1930s. The IMF is under American influence and as long as the US pulls the IMF string they will stall and stall when it comes to including China. China is not stupid, they know this. So, to get around the IMF, they created not only currency swap agreements with a number of countries to circumvent the dollar, but also their own reserve bank, the Asian Infrastructure Investment Bank (AIIB) as a means to give the yuan reserve status outside of US controlled institutions. The IMF will rue the day it didn't give China what it wanted when it wanted it. By the time the IMF comes around to letting China in, it will be too late as China will using its AIIB bank to replace the IMF and become the new IMF. This will break us from within so I guess the Supreme Commanders will destroy China bit by bits.